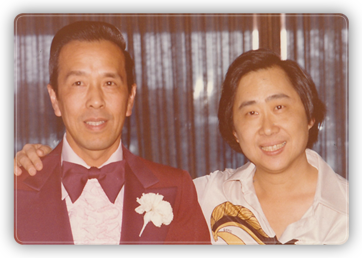 Both immigrants from the same small village in mainland China, David Wong (right) and Raymond Wong (left) started their life’s journey in America at On Lock Sam’s restaurant in downtown Stockton back in the late 60’s– Dave as a busboy and then a waiter; Raymond as a prep cook and then ultimately headcook. In the early 70’s, Dave had become quite popular with his customers, always joking and providing excellent service, while Raymond became quite adept with the woks. Together the two decided to risk their life savings to pursue their mutual dream of owning their own restaurant. Never in their wildest imagination would either of them have thought that two boys from mainland China could come to the U.S. and become the American dream. But, that is exactly what happened. The grand opening was a huge success. And, although things were not always easy, and the hours were long, the effort was worth the sacrifice. In the late 70’s and 80’s it was not uncommon to see customers waiting 2 hours for a table at Dave Wong’s on a weekend. As the years passed, it was time for a larger restaurant with a more accessible location to the blossoming Interstate 5 and surrounding communities. Not to mention that a second generation of Wong’s were ready to work. In 2002, a second location with a more modern restaurant, bar, and deli was built on West March Lane while the original Pershing Avenue location became a “deli only”. The original plan in 2002 was to move everything to March Lane however, it took us a little longer than expected. Now fifteen years later, in March 2017, we have finally completed the move! Dave and all of the cooks and staff from Pershing will now be reunited with the team at March Lane. A popular dining destination for UOP grads and second and third generation Central Valley families, Dave Wong’s is always a favorite amongst the locals. Celebrating our 43rd year serving Stockton and the greater Central Valley, we invite you to Come Taste the Flavors of the Orient!